with space for up to six conductors in one modular system. Fast-on connections allow for fast easy wiring. Field modifiable conductors and housings make installation a snap. 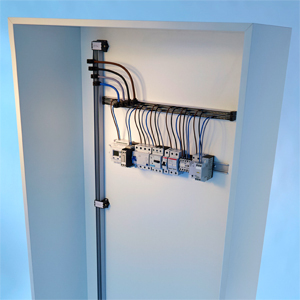 Auxigaine is a modular wiring system containing up to six conductors in one space saving rail assembly. Simply cut the standard 1.9 meter insulation and conductors to desired length, insert into bar holders, and attach supply and outgoing connectors. Mounting plates and accessories allow for maximum mounting flexibility.